The Council has just released its Air Quality Annual Status Report 2018 and it is not looking good for Gosforth High Street. We had expected that the 2016 reading of 51μg/m3 for Nitrogen Dioxide (NO2) was a one-off due to the roadworks at the junction with Salters Road, but in 2017 the figure had increased again to 59μg/m3. Both are substantially higher than the legal maximum of 40μg/m3. In 2017 Gosforth High Street actually had the worst recorded air pollution of anywhere in the city. *All monitors are located next to busy roads. 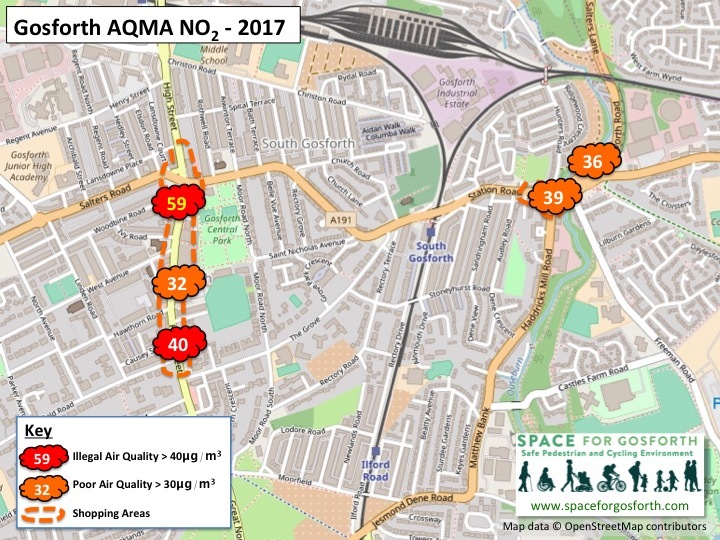 Elsewhere in the Gosforth Air Quality Management Area (AQMA) readings have improved slightly since 2016, although the reading at the south end of the High Street shops is also still above the legal limit. At Haddricks Mill / Station Road air quality is only just within the legal limit despite Killingworth Road being fully closed to traffic for the second half of the year (in 2016 the readings were 42 and 46). This might form part of the explanation why the reading on Gosforth High Street has increased in 2017. All the above readings come from Nitrogen Dioxide diffusion tubes with the reading at the north end of the High Street measured at the north end of the shops shown in the title picture. 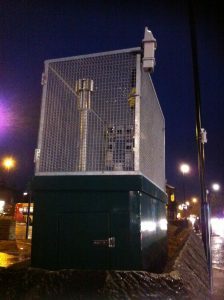 Gosforth also has an automatic monitor (shown below) located in the Salters Road car park. Over 2017 and into 2018, this monitor has been recording much lower (and legal) air quality results. We reported in our 2016 Air Quality Update that, based on this monitor, we thought that air quality on the High Street was improving. The difference in the two results is likely to be explained by the fact that the automatic monitor is located in an open space where pollution can disperse, whereas the official monitor is located in the main part of the High Street with buildings on either side forming a “street canyon”. Street canyons can dramatically affect pollution levels. If the wind typically flows along the street then this can actually flush out the pollutants and cause them to disperse more quickly. Where the wind flows across the street this can trap the pollution within the canyon and prevent dispersal. According to the government, the most effective way to improve air quality is to introduce a Clean Air Zone. The Council is working on a plan to meet the UK High Court’s directive to reduce concentrations of NO2 to meet legal limits and to do so within the shortest possible time. These results make it much more likely that Gosforth High Street will need to have its own Clean Air Zone. 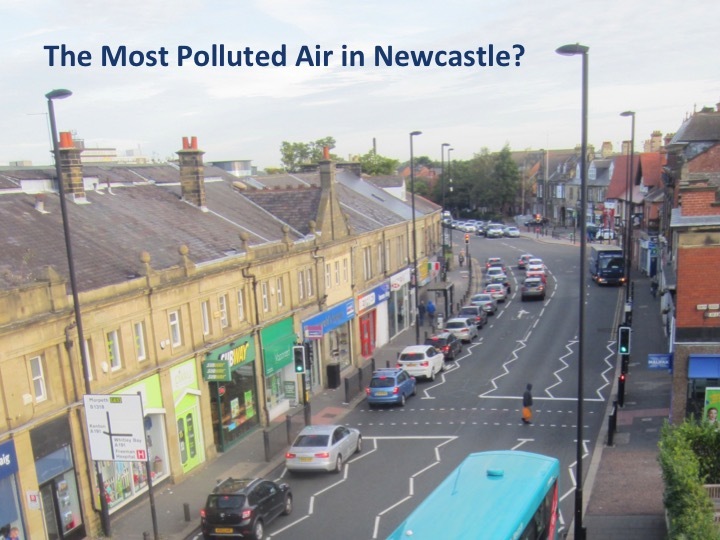 For more on Clean Air Zones see our blog The New Newcastle Air Pollution Plan. Details of this plan should be published early in 2019. Air quality across Newcastle city centre also remains poor. At Percy Street and by Swan House roundabout, where the highest figures have been recorded, the results are no better than in 2016. In fact the only location with a noticeable improvement is outside Central Station, although even there readings are still above the legal limit. In our 2016 Air Quality Update we said “The approaches used to date have been shown to be too slow or ineffective. To achieve compliance in the shortest possible timescales real commitments are required to effect a step change so that the city can be rid of dangerous air quality levels it has suffered for too long.” It is clear that this is still the case. We hope we will not have to repeat this sentiment again when 2018 figures become available this time next year. While initiatives such as the Haymarket Moss Tree might be a useful talking points, it is not an alternative to substantive action. Of all the measures listed in the current report, one of the most effective (as described by the report) is car parking charges. In Newcastle the Council continue to subsidise free parking after 5pm, money which they could be using to improve non-polluting travel options. For most of us, being “Alive after 65” is more important than saving a few pennies on parking fees. Three hundred and sixty lives are cut short every year in Newcastle due to poor air quality. Air pollution is also a known cause of a range of other health issues including asthma, lung disease, heart disease, cancer, dementia and infertility. If you live or work near a polluted location and have breathing or other health issues that could be linked to pollution, you may wish to mention this to your doctor next time you visit. 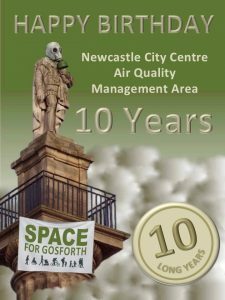 April 2018 was the 10th anniversary of the city centre and Gosforth AQMAs. The Council have had ten years to fix this problem, but the latest reading for Gosforth High Street is worse than ever. In 2015 the UK Supreme Court directed the government to ensure that air quality meets legal limits, and to do so within the shortest possible time scales. That was over three years ago. The Council must act now to protect the health of residents or be held in contempt of court. Do you mean the express buses? They all stop on Gosforth High Street though only at selected stops. I’ve been told by some of the local shop-keepers that quite a lot of people use them to visit the High Street. It is likely that the Newcastle pollution plan due at the end of this year will include some retrofitting to improve emissions from older buses. This is certainly welcome. As someone who lives on the High Street end of Woodbine Road this is a particular worry for me. The change of the junction at Salters Road/ High Street has been all about speeding up the flow of traffic through the junction, with the possible spin off that it would reduce air pollution by improving that flow. In both cases it has proved a failure and changes to junctions and crossings have made it more frustrating and dangerous for pedestrians, cyclists and motorists. The granting of planning permission for yet more houses to the North will lead to even more traffic on the HIgh Street . All in all a spend of loads of dosh to achieve no desirable ends. I agree that it would be better if many of the X buses terminated at the Regent Centre and were linked in by Metro and/or electric buses to the Haymarket. Rather than making it harder for people from the villages to come to Gosforth High Street it would make more sense for all the new buses to be electric (like in many other cities) – I’m not sure why in Newcastle they still introduce new diesel ones. Ref the yellow lines I was of the understanding that it is not actually illegal to drop off, pick up, or load, unload. Hence why huge lorries delivering crates of drinks to the front of the restaurants do not get in trouble. However I was told once that if you feel they are there an ‘excessive’ amount of time to report it (but really any stopping in the left lane causes real problems especially for cyclists). This makes interesting reading. I’m pretty sure that NCC are saying that things have slightly improved since 2016 except in a few locations, which when adjusted for distance to nearest exposure, are still over 40, which have been worth highlighting by various parties elsewhere including SPACE. 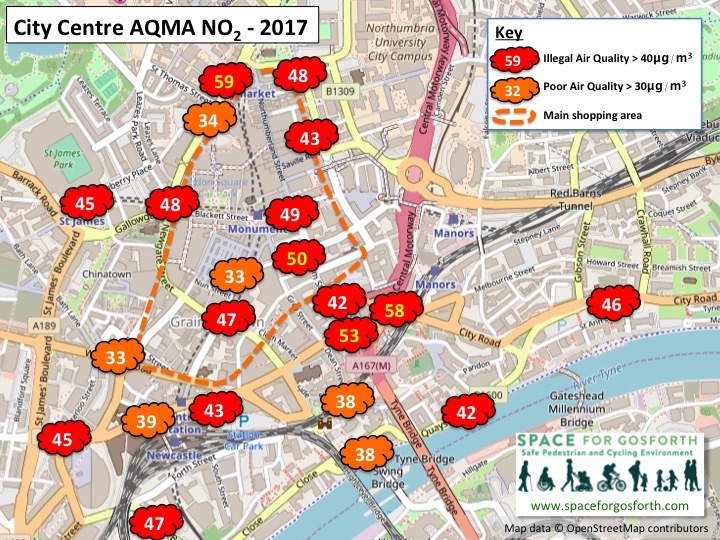 I would like to see sites where combined NO2 and PM readings are taken and also readings taken just outside any AQMA’s in actual residential areas, as there is no surprise that “In the City of Newcastle, the main pollutant of concern is NO2, with the primary source being from road vehicle exhaust”, when the monitoring sites are next to roads. Let’s monitor AQ everywhere. There also appears to be a major seasonal effect with numbers over winter generally higher. Why? With higher average winter winds, could this be an increase in background NO2 blowing in (vehicles but also residential heating/wood burners), or just a 20 – 60 % increase in traffic? Will the 60% NOx increase from Newcastle airport by 2035 have an (minor) impact in future? Furthermore use the attached to add various Gosforth GNR postcodes and see what comes up https://www.bbc.co.uk/news/science-environment-42566393 It all seems hunky dory! Whilst this article https://www.bbc.co.uk/news/uk-40726868 is in the other direction. Both one could suggest are misleading. With regards their AQ action plan this is a bit of a half-cocked attempt at saying ‘we’re doing something’ whilst not really doing anything much. Too many actions which are being considered, not yet implemented, to be reviewed, unable to be actioned, hopes and aspirations. It recognises that public transport and in particular the Metro help to reduce air pollution, however they have no control over it, so the Nexus reduction in Feb 2017 of nearly 25% of peak train from Regents Centre in/out of town and then a further recent 11% reduction in Sept 2018 of those remaining, doesn’t help. See @My_Metro for daily updates of overcrowded peak trains, cancelled trains, long waits etc etc. This will only force many people in the medium term to use another method of daily transport that they believe they can control. A additional good point has already been made re NCC’s Alive after 5 free parking which go against some of the listed actions. So more action please, with NCC at least using their existing powers to enforce, more modern, integrated and cheaper public transport, better park and ride provision, bus contracts, etc etc. OK, how about an elected major with additional powers with regards planning and transport for starters!